To help kick off the brand new academic year at Wayne State, the Sustainability Scholars’ Forum is organizing our 2016 research event on Friday, September 9, 2-4 pm, at the Community Room in the Undergraduate Library, so please do save the date! 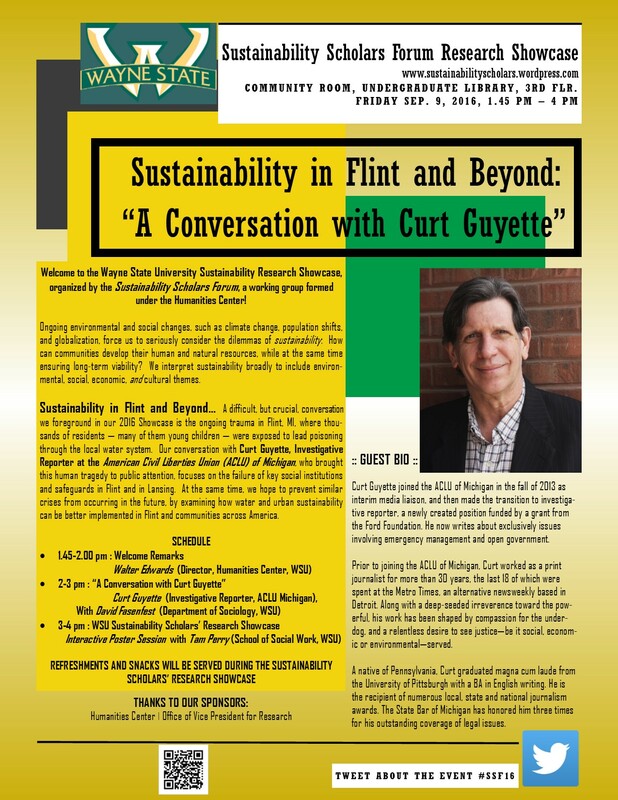 (You might remember our hugely successful inaugural research symposium last year on “Social Institutions and Sustainability.”) This year, our theme is “Sustainability in Flint and Beyond,” and we have a wonderful schedule lined up for you. This includes a Research Showcase of some cutting-edge social science research at WSU on sustainability, and a candid Conversation with Curt Guyette, the award-winning Investigative Reporter at ACLU Michigan, who helped uncover the ongoing Flint water contamination crisis. We hope you will attend, continue to forge close connections across disciplinary boundaries as we explore new meanings and formats of sustainability, and of course to support your colleagues’ work. Please share the attached flyer (PDF and PJPEG versions) widely with your colleagues and students, and encourage them to come by as well. Attendance is free and open to the public and WSU community. Please do not hesitate to email any of the members on the Executive Committee (Rahul Mitra, Alisa Moldavanova, Tam Perry, David Fasenfest, Jefferey Ram) if you have any questions or suggestions. Thank you to all our wonderful sponsors, participants, attendees, and others who have supported this event for making it an unadulterated success! We were thrilled at the amazing turn-out (more than 65 people in a packed Community Room during Dr. Andrew Hoffman’s keynote talk! ), and caliber of the scholarship on display (almost 20 pieces of research by scholars from around the country — and Canada!). We simply couldn’t have organized this symposium without the continued support and goodwill of our sponsors — the Humanities Center at Wayne State University, the Office of the Vice President for Research, the Department of Communication, the Department of Political Science, the Department of Sociology, and Critical Sociology journal. Special thanks are also due to our keynote speaker, Dr. Andrew Hoffman (University of Michigan), whose talk completely engaged our attendees, and who also donated copies of his books to the Wayne State University libraries. 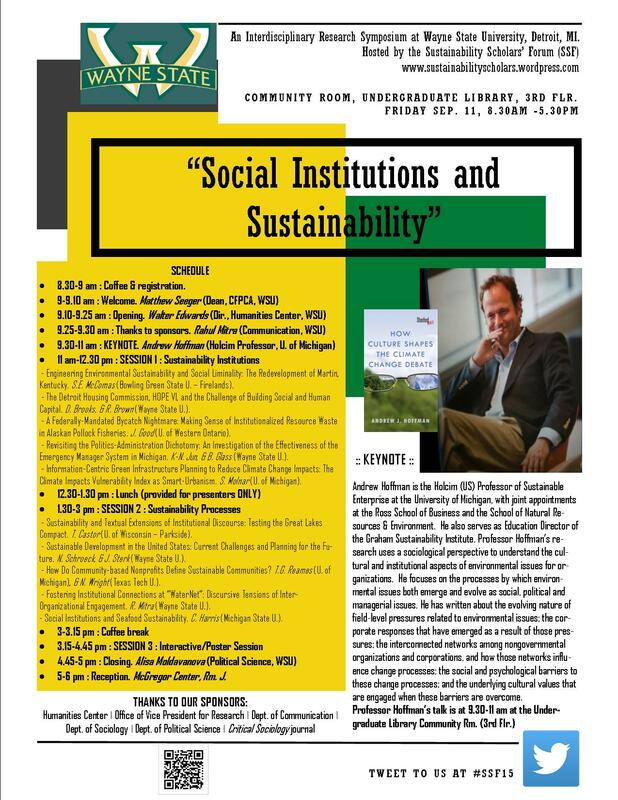 We hope to make this symposium a regular event at Wayne State University, in keeping with the mission of the Sustainability Scholars’ Forum research working group, which is to showcase the wealth of social scientific and humanist scholarship related to sustainability — paying heed to its intersections of environmental, social, and economic complexities. Thanks to the wonderful feedback received from attendees, we have some great suggestions for future themes, venues, and formats — and hope to implement them! If you are a a graduate student or faculty member at Wayne State University, and would like to be involved with the Sustainability Scholars’ Forum, please email us at ssf@wayne.edu. If you are at a different university, or an interested practitioner who would like to know more about our group and the work we do, you can also email us at ssf@wayne.edu. We hope to hear from you! Culture Lab Detroit fosters conversations and collaborations between Detroit and the international design community. Through public discussions, exhibitions, public art projects, and creative partnerships, Culture Lab Detroit explores the vital role of culture in the mindful regeneration of the city. Jane Schulak founded the organization in 2013, in partnership with the Detroit Creative Corridor Center and the College for Creative Studies. The Sep. 11 event on “Designing for Today’s Urban Landscape,” will be at 6.30 pm, at the Detroit Institute of Art, just off Wayne State University’s campus, about a 10 minute walk from the McGregor Center, where the evening reception will be held. So, in case you’re hungry for more sustainability fare after the symposium and reception, you can saunter across to the DIA. The closest parking structures that offer visitor parking are Structures 2, 5, and 6. (See marked in red ovals.) Structure 6 is easily accessible from Cass Ave. or Woodward Ave.; Structures 2 and 5 are accessible from the John C. Lodge Service Drive or Third Street (both off W. Warren Ave.). Visitor parking in the structures costs $7 for the whole day. 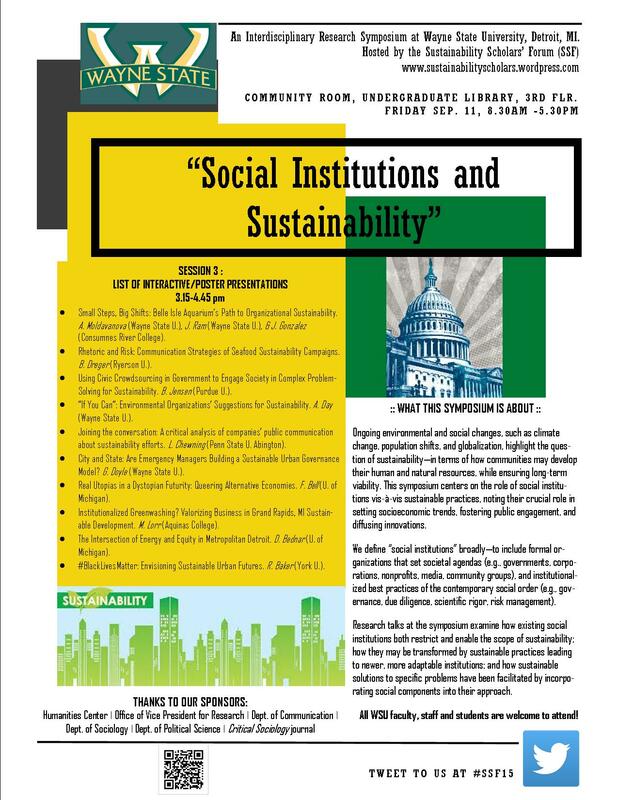 We’re very excited to share flyers for the “Social Institutions & Sustainability” research symposium, to be held at Wayne State University next weekend (on Friday, September 11)! (Remember: if you tweet, use hashtag #SSF15). The flyers (both front and back) show the schedule of speakers, introduce our amazing Keynote speaker Andy Hoffman, and provide some background information about the symposium. We hope you’ll join us at the symposium, and the reception at McGregor Memorial Conference Center (Room J) afterward from 5-6 pm. We are thrilled to announce that Dean Matthew Seeger of the College of Fine, Performing, and Communication Arts, and Walter Edwards, Director of the Humanities Center at Wayne State University, will be delivering the symposium’s Welcome remarks and Opening comments, respectively. Dean Seeger’s research focuses on crisis and risk communication, organizational response, and community coordination — and is thus wonderfully aligned with our symposium theme of “Social Institutions and Sustainability.” Director Edwards, for his part, has worked tirelessly in helping foster interdisciplinary efforts at Wayne State, especially among and with the social sciences and humanities, and has been a key supporter of the Sustainability Scholars’ Forum (SSF) — the research working group that has organized this symposium. Each presenter should prepare a talk for 12 minutes. Audio-visual equipment will be provided. After all presentations in the session are complete, a joint question-and-answer (Q&A) panel will be fielded, lasting for around 30 minutes. Presenters are invited to use an interactive and/or poster format to showcase their work. At the session’s start, each presenter will briefly highlight his/her work in 5 minutes. After these oral highlights, the audience will circulate among the different interactive/poster displays to engage in more detail with the presenters about their work. Each presenter will be provided easels and foamcore frames for their poster to be displayed (clips/pins will also be provided). 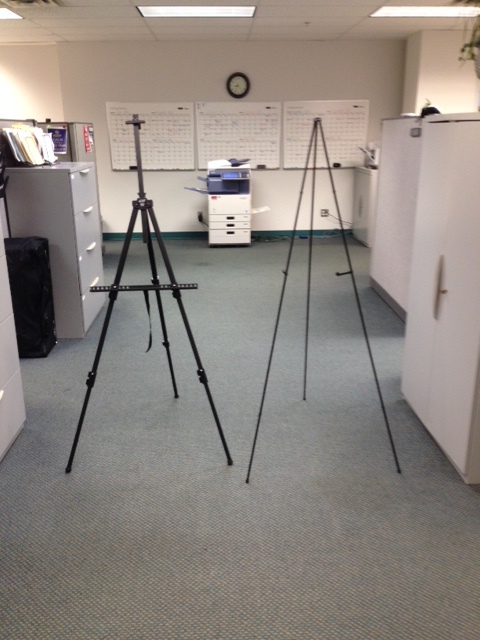 The easels and foamcore frames can support posters up to 24″ X 36″ (maximum size). Presenters may also integrate audio-visual and other interactive elements (e.g., music, video clips, audio recordings, maps). Sockets for charging devices will be available.